Established in the year 2010, we, Amba Steel & Metal Udyog are the manufacturer of Hatch Boxes, Scrub Stations, Clinic Storage Cabinets, Surgeon Control Panel, Laminar Air Flow Room, Magnetic Writing Boards, Prefabricated Operation Theatre and Cascade Pressure Relief Damper. We are the service provider of Hatch Pass Box Maintenance Service. Our products are manufactured using the superior quality raw material, which is sourced from the trusted vendors of the market. Clients appreciate these products, owing to their reliable working, efficient functionality and low maintenance. Our list boards are highly acknowledged for their clarity and excellent visibility. Further, the light boards offered by us have polished mirror surfaces and are made available with multi-positional fixing brackets to the clients. These products can also be availed as per the specifications mentioned by the patrons. Empowered by a technologically advanced infrastructure base, we have been able to fabricate our range in bulk quantities. Furthermore, our hard-working team of professionals makes painstaking efforts to manufacture optimum quality products for the clients, so as to meet their varied needs and requirements. It is just because of this approach of our professionals that we have been able to gain maximum client satisfaction as well as establish a credible position in the industry. Under the visionary guidance of our owner, Mr. Lakshay Suri, we have been able to attain a respectable position in the industry. His in-depth knowledge and vast industry experience have led us in overcoming the counterparts. We have appointed a team of self-motivated and efficient professionals who understand the varied needs of clients and serve them accordingly. Our team of professionals is well qualified & versed in the latest manufacturing techniques and methodologies. The wide range that we offer caters to the requirements of varied medical care units & hospitals. At regular intervals, we organize several training sessions for our professionals so that they are able to keep pace with the technological advancements and on-going trends in the industry. Due to this approach, our professionals offer the products using advanced techniques. 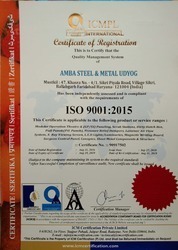 Amba Steel & Metal Udyog is a ISO Certification of Resgistration. 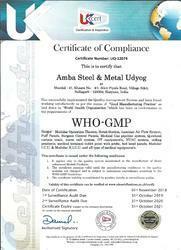 Amba Steel & Metal Udyog is a WHO-GMP Certification. Amba Steel & Metal Udyog is a Environment Management System Certification of Registration. 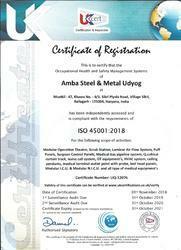 Amba Steel & Metal Udyog is a Occupational Health & Safety Management System Certification of Registration. 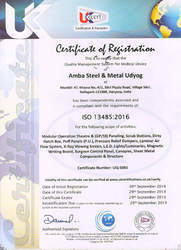 Amba Steel & Metal Udyog has a Certification of Quality Mangement System. Since our establishment, we are offering a qualitative range to the esteemed patrons. Clients prefer us over our counterparts due to the transparency followed by us in all business transactions. 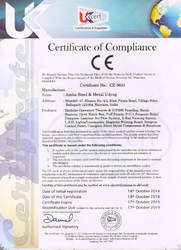 Amba Steel & Metal Udyog has a Certification of Compliance.